Rosacea is sometimes referred to as ‘Acne Rosacea’, but you will know as a Rosacea sufferer that the skin condition is actually completely different. Rosacea is a common skin ailment that is characterised by facial flushing (which can be highly embarrassing for many of us), skin hyper-sensitivity, persistent redness, broken capillaries, papules and pustules (which are what can link the look of the condition to acne). For those of us that are affected with more advanced Rosacea, the symptoms can extend to tissue distortion and can even involve the eyes. You will find in more severe cases of Rosacea that the lesions are dome shaped rather than pointed, like that of acne, and there is an absence of comedones (blackheads & whiteheads) and nodules (cysts). The face is where Rosacea tends to strike, which is extremely annoying for us as it becomes very obvious and noticeable. Rosacea is categorised into four key sub types and is a progressive vascular condition that mainly affects the nose, cheeks, forehead and chin. In the early stages of Rosacea, you will notice that flushing comes and goes. With continued exposure to ‘triggers’, facial redness becomes more intense, looking like mild sunburn. Broken capillaries and red bumps may also become visible in the reddened area. Those of us experiencing a more severe case of Rosacea will notice permanent redness, swelling and burning sensations are more intense. 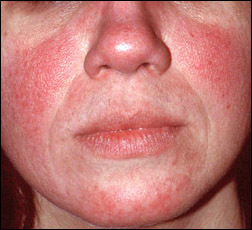 Advanced rosacea can, in some cases, cause facial disfigurement and disabling burning sensations. Unfortunately, the cause of Rosacea is largely unknown, but a genetic predisposition is often at the root of development. Exposure to the sun, on sensitive skin types, is thought to be the number one stimulator of the condition and it is often the case that sufferers have had a lifestyle with higher than average sun exposure – stay out of the sun as much as possible and if you do have to expose yourself to sunlight, make sure you wear a high SPF! Rosacea generally affects those aged between 30 and 60 and is more common in those with fair skin, blue eyes and of Celtic origin and is often referred to as ‘the curse of the Celts’. Affecting both sexes it is three times more common in women than men, however men suffer more severe symptoms. In addition to skin treatments and skincare, rosacea patients can improve their chances of remission by identifying and avoiding lifestyle and environmental factors that may ‘trigger’ flare ups or aggravate their condition. These triggers are very specific to the individual as one trigger may cause a flare up for one person but have no effect on another. Rosacea is activated by a number of factors including genetics, hormones, environment and emotion. The number one constant trigger factor to rosacea is regular sun exposure. It is recommended that rosacea sufferers keep a diary to help identify their triggers so they can be avoided as much as possible. It is impossible to predict how an individual’s rosacea will progress, although there is evidence that the signs and symptoms tend to become increasingly severe without treatment. A survey, by the American National Rosacea Society, found that about half of rosacea sufferers said that without treatment their condition had advanced from early to middle stage within a year. Fortunately, with treatment, a healthy lifestyle and avoidance of rosacea triggers has been shown to effectively control its signs and symptoms. No scientific research has been performed on rosacea and heredity but there is evidence to suggest that it may be inherited. There is a strong link between rosacea and ethnicity in one’s potential to develop the condition.In one survey, 40% could name a relative who had similar symptoms. In another, 33% of participants reported having at least one parent of Irish heritage and 26% had a parent of English descent. Rosacea is a chronic condition rather than a short term condition and is characterised by its relapses and remissions. A study of 48 previously diagnosed rosacea patients found that 52% still had active rosacea, with an average duration of 13 years. The remaining 48% had cleared and the average duration had been 9 years. Whilst there is currently no cure for rosacea its symptoms can usually be controlled with skin treatments, skincare, medical therapy and avoidance of triggers. Can you suffer from regular acne in addition to rosacea? Rosacea and acne usually appear separately but it is possible to be affected by both. These are two very separate conditions and require different treatment. Acne is associated with plugging of the sebaceous duct resulting in blackheads and pimples on the face, chest and back. Rosacea is linked to the blood capillary network of the facial skin and causes redness, broken capillaries, papules and pustules and rarely goes beyond the face. Is dry, flaky skin normal with rosacea? It is estimated that approximately half of all rosacea sufferers experience dry skin. Some treatment can have a drying effect and others are more moisturising. To combat tight, dry skin apply a light, oil free moisturiser, such as Skinceuticals Hydrating B5 gel, to hydrate without causing more break out. Is oily skin common with rosacea? All skin types can be affected with rosacea, there is no standard skin type that is more susceptible. Many sufferers have dry flaky skin whilst others experience oily skin, or both. Yes, known as ocular rosacea. Symptoms may include a watery or bloodshot appearance and a dry, gritty feeling with burning, itching and stinging. Light sensitivity and blurred vision may also be present.It is extremely important to consult a dermatologist or ophthalmologist for appropriate therapy. No, rosacea is not known to be an infectious condition and there is no evidence that it can be spread by contact with the skin or through inhaling airborne bacteria. How is rosacea treated by medical professionals? There are a variety of different approaches Doctors or Dermatologists use when it comes to treating rosacea. Topical and oral (systemic) treatment can be used singularly or in a combined approach to treat the varying degrees of severity. Topical treatments include Metronidazole gel, azelaic acid and Brimonidine. Oral treatments include antibiotics and more recently low dose oral retinoids such as Roaccutane have been used with positive results. Antibiotic therapy is used at a such a low dose that it has no antibiotic effects but serves to reduce inflammation.